OSWEGO — Renowned cellist Matt Haimovitz will launch the season’s Artswego Performing Arts Series at SUNY Oswego with the unaccompanied cello suites of Johann Sebastian Bach performed in four different campus and community locations on Sept. 15 and 16. Cellist Matt Haimovitz, who as a prodigy played with Zubin Mehta at 13 and recorded with the Chicago Symphony at 17, now takes it to the streets. He will offer a four-stop “Moveable Feast” of Bach suites Sept. 15-16, concluding with a performance for SUNY Oswego’s Performing Arts Series at 7:30 p.m. Sept. 16, in Sheldon Hall ballroom. With earlier stops in Syracuse, downtown Oswego and the college’s Penfield Library, the musical tour will conclude with Haimovitz’ ticketed performance of the last three Bach suites and accompanying overtures in solo recital in at 7:30 p.m. Sept. 16, in SUNY Oswego’s Sheldon Hall ballroom. Designed as and titled “A Moveable Feast,” the program reflects the Israeli-born musician’s unconventional career path — taking classic works and new compositions beyond the concert hall. Equally comfortable performing on street corners, in clubs and coffee houses, Haimovitz shares his love of music with listeners, wherever they may be. Haimovitz debuted at age 13 with Zubin Mehta and the Israel Philharmonic. At 17, he made his first recording with James Levine and the Chicago Symphony. He went on to perform with the Berlin Philharmonic, New York Philharmonic, Boston Symphony and others, before his mold-breaking career turn as an traveling soloist. 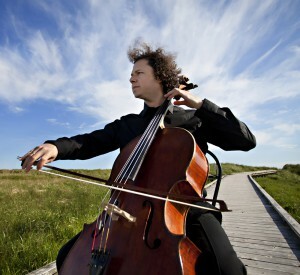 His latest album “Orbit,” released in August 2015, is a compilation of his solo cello works from 22 contemporary composers. He has earned ASCAP’s Concert Music Award, for his pioneering spirit and advocacy for living composers, and the American Music Center’s Trailblazing Award, honoring far-ranging and far-reaching contributions to American music. During his two-day visit to Central New York, he’ll offer all six of the Bach suites, paired with new “overtures” commissioned from a diverse group of contemporary composers: Philip Glass, Roberto Sierra, Du Yun, Vijay Iyer, Mohammed Fairouz and Luna Pearl Woolf. Haimovitz will begin the musical tour on Sept. 15, with a “Live at Noon” broadcast from the studio of WCNY Classic FM (91.3) in Syracuse, and then travel to river’s end bookstore in downtown Oswego to perform at 3 p.m. The music resumes at 5 p.m. Sept. 16, in Tyler Art Gallery at Penfield Library on the SUNY Oswego campus in conjunction with the opening of the “Origins: Tradition and Innovation” art exhibition, before swelling to a crescendo that evening in the Sheldon Hall ballroom. Tickets for Matt Haimovitz’s evening recital are $15 ($5 for SUNY Oswego students), available at all SUNY Oswego box offices, online at tickets.oswego.edu or by calling 315-312-2141. Parking for the performance is included in the price of a ticket and is available in the lots across from and adjacent to Sheldon Hall.